The Index opened flat to positive around 8345 but saw selling pressure to touch the lows of 8270, a smart short covering rally moved the index back above 8300 but missed closing in positive by a whisker to close at 8319.00, loss of 15.60 points. The broader market was also weak, with 641 advances to 825 declines. 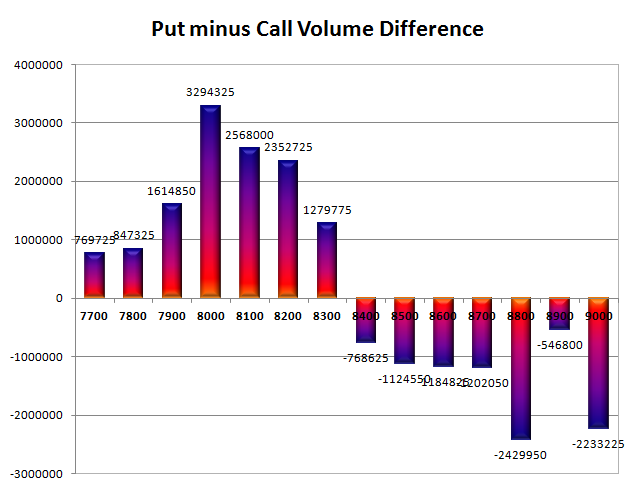 The broader range as per Option Table at the start of the series is 8000-8800. Call option 7900-9000 added huge 34.80 lacs OI. 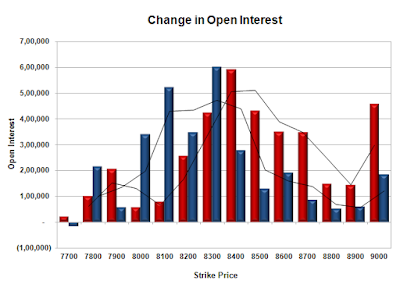 Put option 8600-7800 added huge 26.78 lacs OI with profit booking seen at 7700 and below strike prices. Nifty Open Interest is at 1,29,73,375 up by 28,08,900, with decrease in price, most probably 100% rollover with huge short build-up. Bank Nifty Open Interest is at 16,12,425 up by 6,24,525, with decrease in price, most probably 100% rollover with huge short build-up. FII’s bought 2.14 lacs Futures, which includes 129258 contracts long liquidation and 109694 contracts short covering, with decrease in net OI by 238952 contracts (includes 190939 longs to 182396 shorts for the day) and the Average Price comes to 8632.51. FII’s Index future open contract as on date is 270518 Longs to 275464 Shorts, Net Short 4946 contracts. 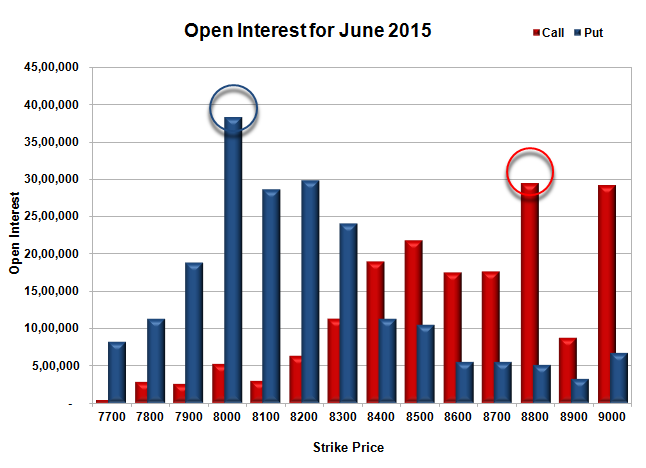 Initial support at 8300, with OI of 24.08 lacs and below that at 8000 with highest OI of 38.30 lacs. Initial resistance at 8400, with OI of 19.02 lacs and above that at 9000 with OI of 29.42 lacs. Day Range as per Option Table is 8251 - 8385 and as per VIX is 8244 - 8394 with 8318 as the Pivot.